Considered the benchmark in 4WD shock absorbers, Old Man Emu's locally-designed and manufactured Nitrocharger low-pressure gas twin-tube units are available to suit almost every 4WD vehicle and application. Progressive and responsive, the value for money, legendary Nitrocharger suspension control units set new standards in ride comfort over my terrain and simply outperform the competition. Whether off-roading or commuting, laden or unladen, durable OME Nitrocharger shock absorbers have no peer. Ride, handling, suspension travel - all are instantly improved with OME Nitrochargers. And that means comfort and safety are also increased. Change your shock absorbers and change your driving life - it's that simple! Why? Well, it's common knowledge that few original equipment shock absorbers perform as they were originally intended for more than six months - and very few last more than a year. This situation is the norm because, in OME's view, the original equipment valve codings (the predetermined upward and downward resistant strength of the shock absorbers) were ill-conceived from the start. That is, they may be too stiff or too soft at the appropriate shaft speeds in comparison with the springs and for the actual intended vehicle use. Production vehicles are expected to cope with varying conditions - from off-road, to serious 4WD, to choppy bitumen, freeways and corrugated dirt roads - so the original equipment shock absorbers are very much a compromise. OME uses its hand-made "pull apart" prototype shock absorbers to determine a wide range of vehicle specifications that reduce the production-line compromises and improve ride characteristics. These results form the basis for the no-compromise OME production shock absorber. WHY BUY A SET OF FOUR SHOCK ABSORBERS? It's a simple fact of life that shock absorbers do wear out and should be replaced. It's also fact that a vehicle may be equipped with shock absorbers that were not designed to meet your requirements. OME shock absorbers last much longer than original equipment units. They also reduce pitch and body-roll. OME shock absorbers will make your vehicle track better and handle better. It will, therefore, be a safer vehicle and the ride will be more comfortable - regardless of whether your vehicle is brand-new or old. But, for the best result, it's strongly recommended that all four shock absorbers are replaced at the same time. Nitrochargers are not the cheapest shock absorbers on the market, but they are the best value for money. Why? Because the imported models weren't developed to take the punishment handed out by Australian roads. Fifteen years experience in 4WD suspension, a strict policy of thorough development before the introduction of any new product and an extremely successful long-term involvement in off-road racing led to the production of Australia's best shock absorber - a very special shock absorber, ideally suited to our particular and exacting conditions. 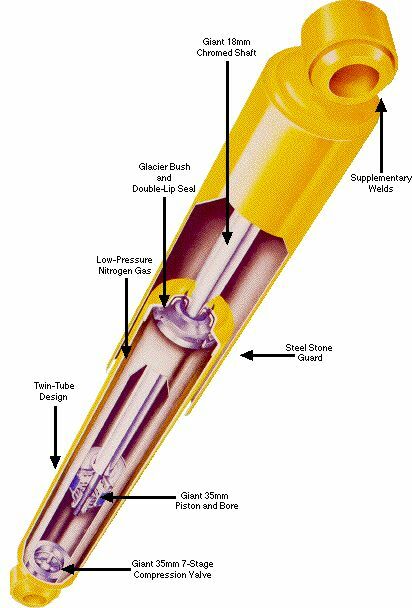 Nitrocharger's unique glacier bush, its teflon-impregnated piston-rod guide and teflon-banded piston eliminate metal to metal contact within the piston tube itself - thus reducing bore wear, friction and heat. New-design multi-stage valves - including a seven-stage coil-sprung compression valve and a four-stage coil-sprung rebound valve - improve the Nitrocharger's consistent performance characteristics, enhance its fine-tuning capabilities and increase overall durability. As the piston travels in a non-pressurized hydraulic twin-tube shock absorber, oil passes through the base or compression valve to and from the outer-tube, which serves as a reservoir. Part of the reservoir must be filled with air to allow movement of the piston-rod and this air is thus open to the oil in the reservoir. The air does little to prevent foaming of the oil, which drastically reduces the efficiency of the shock absorber and causes "fading" to occur. The OME Nitrocharger replaces the air in the reservoir with pressurized nitrogen gas. This aids in eliminating foaming and subsequent fading, while maintaining optimum shock absorber performance. Essentially, there are two basic varieties of gas shock absorbers in common usage today: one is the low-pressure twin-tube shock absorber, while the other is the high-pressure "De Carbon Principle" mono-tube. High gas pressures are the norm in Europe, but the Australian on-road and off-road environments embody markedly different needs and, in the OME experience, there are two problems with high pressure shock absorbers. Under low pressure, the broader range of bottom-end softness is able to be easily fine-tuned. Such is not the case with the high-pressure approach, as the system is inherently stiffer - regardless of the setting. The degree of bottom-end softness dictates the level of comfort experienced whilst driving at low speed. Consequently, the low-pressure system is more comfortable and more desirable. The other problem is that the internal gas cylinder of the De Carbon principle mono-tube design has a shaft length shorter than the Old Man Emu twin-tube design. If an OME unit and a mono unit of the same compressed length are fully extended, the ONE unit will extend further. On 4x4 vehicles, therefore, the OME unit will allow the axle to drop down further and gain traction, dependent upon suspension design. The walking effect of your 4x4 may be limited by the shorter-travelling mono-tube, but not by the Old Man Emu Nitrocharger. The inherent limitation of original equipment shock absorbers, which tend to be comprised of small componentry and contain only a small volume of oil, is that the original equipment units are insufficient to control large springs, adequately, in hard terrain. They quickly begin to "fade" and are less durable, the level of ineffectiveness indicated by excessive bounce or sloppiness and a deteriorating ride. OME's engineers have many years experience in determining just what is required to ensure the optimum performance in a 4WD vehicle shock absorber. The Nitrocharger has a larger bore, more oil, a stronger 18mm shaft and much more - features designed to eliminate fade, increase durability an effectiveness which result in better ride and handling. The valve itself consists of a seal around the piston circumference and a series of holes, or slots, to allow the shock absorber fluid to pass through. The size and number of the holes determines the speed at which the fluid passes and this, in turn, determines the resistance of the shock absorber and the subsequent ride. Valve coding is an engineer's term describing a shock absorber's compression and rebound valves control characteristics. Old Man Emu shock absorbers have eleven valve stages: seven in compression and four in rebound. All components of the valve, including washers, springs, oil flow holes and so on, can be varied by OME in size and/or strength to create an optimum combination of ride and control. Shock tuning is a combination of theory and application and the correct valving for both compression and rebound is determined by extensive ride evaluations - over all types of surfaces, at different speeds and with various loads. Old Man Emu's engineers undertake the task of determining the valve combination which, in compression (downward movement), provides both a good highway ride and off-road traction and yet still keeps the wheels controlled at speed on bumpy surfaces. In rebound (upward movement), the goal is to prevent the vehicle from being launched by the spring and, again, keep the wheels in contact with the ground. OME carries out all its shock absorber evaluation and valve coding work in Australia, unlike most other aftermarket suppliers. As expertise in valve coding is a scarce commodity in this country, our competition is forced to seek overseas solutions to local problems. Combining this valving with other variables - including open and closed lengths, mounting types and bush configuration - OME can offer over 200 different fitments: and that's a much broader range than any other suspension company in Australia can supply. The improved ride, with the low-pressure Nitrocharger shocks over small bumps, is similar to riding on a cushion of air, the unit's multi-stage valving absorbing large irregularities. Compression prevents bottoming-out and reduces body-roll when cornering, with rear rebound valve coding reducing pitching. Even when the going gets tough and the heat builds up, the Nitrocharger gas unit still maintains its performance - and highlights all the advantages of the system: no aeration, no cavitation and no starving or fading. But, no matter which shock absorber you buy, you will not be able to carry an increased load. You will need a spring kit (either leaf or coil) that's capable of fulfilling your extra load and performance expectations resulting in increased wheel travel and improved ride, handling and traction, whether on or off-road. It should be noted that aftermarket springs will require a completely different valve coded shock absorber to the original equipment spring shock absorber. Again, OME can supply a specialized shock to suit your spring selection.